The freshness fills up your mouth and the bubbles tickle your palate, then you start to feel relaxed magically. That’s the way you know you are drinking Prosecco wine. Have you ever drunk a glass of Italian Prosecco? Maybe yes. But if I ask you where is the best Prosecco wine area or which are the best Prosecco wines, are you able to answer me? Few days ago I have been to the Prosecco wine region for exellence, Conegliano-Valdobbiadene area. The best Prosecco wine area is situated in northern Italy, precisely in Veneto region, and you cannot believe that it is just only 1-hour drive from Venice. You can drink Prosecco everywhere in Italy because it is one of the most common drinks, for instance when you are having an aperitivo or starting the dinner we usually drink a glass of this sparkling white wine. Fruthermore Prosecco is also used to prepare another famous Italian drink: the Spritz. The recipe of this drink inlcudes Prosecco, Aperol or Campari, and soda water. 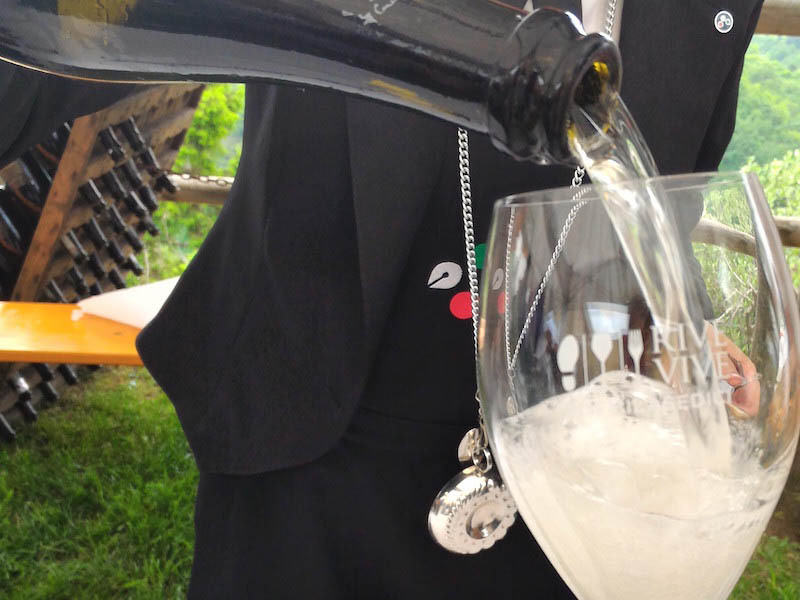 You have to keep in mind that not all the Prosecco wine you drink is the good one, so if you are a wine lover or you are looking for more information about Prosecco, you are in the right place! Prosecco is a white wine produced in Veneto and Friuli Venezia Giulia regions, that is the northeasternmost part of Italy. In 2009 Prosecco obtained the quality label called Denominazione di Origine Controllata (D.O.C. ), i.e. controlled designation of origin. The label is an important identification of quality and the wine is subject to a procedural guideline that allows the wine house to write D.O.C. on the wine bottle label. Prosecco is made of a specific kind of grape called Glera. This wine variety is native to the north-eastern Italy and is known since the Roman time. At that time Prosecco had another name – Puccino – and the grapes grew only in the town of Prosecco, not far from Trieste. 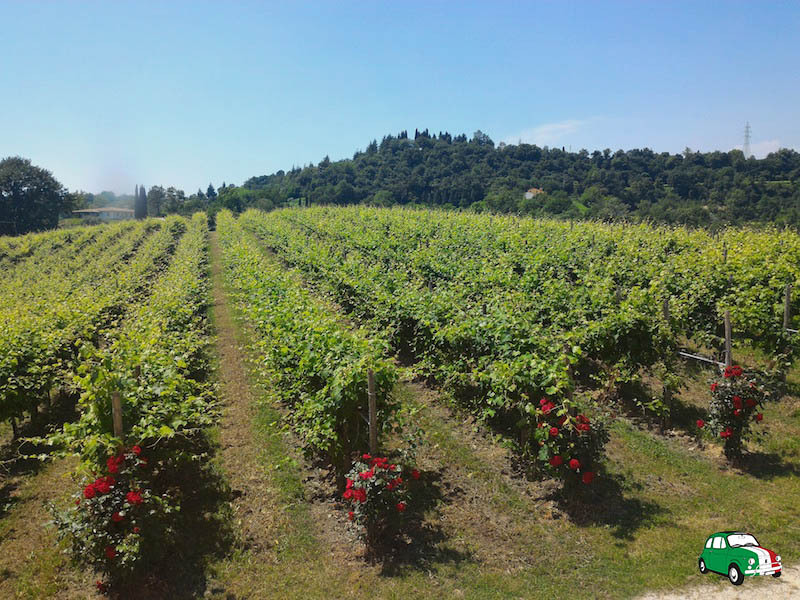 In the 18th century the cultivation of Glera was expanded covering the hill area between Veneto and Friuli. Prosecco spumante could be brut, extra dry, dry and demi-sec depending on the quantity of sugar per litre. On the bottle label you can read “Prosecco DOC con rifermentazione in bottiglia“. This means that the wine is aged with the grape’s natural yeasts in the bottle. These yeasts form a thin film that creates a smoother rounder flavour on the palate. The process is a 19th-century technique. The Prosecco road itself is worth travelling in Veneto region. Conegliano and Valdobbiadene are the two towns at the extremities of a line where you will be completely immersed in the vineyards. The Prosecco road was inaugurated in 1966 and is now 50 years old. Wherever you will find a winery where to stop and sip a glass of chilled Prosecco. 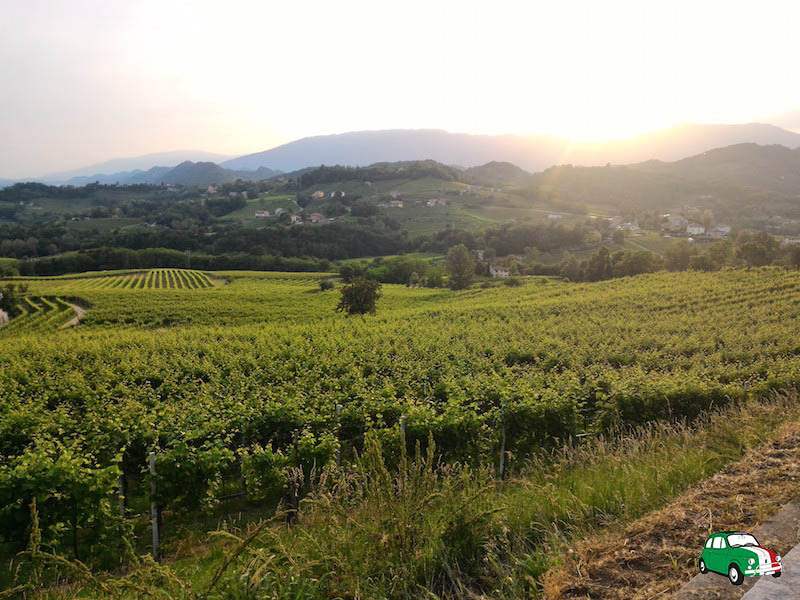 The Prosecco road starts from the Castle in Conegliano near the Enological Institute and cross Collabrigo, Rua di San Pietro di Feletto and San Pietro di Feletto, where you have not to miss the Romanesque parish church of the 12th century. Then the road continues to Refrontolo, famous for the passito (i.e. 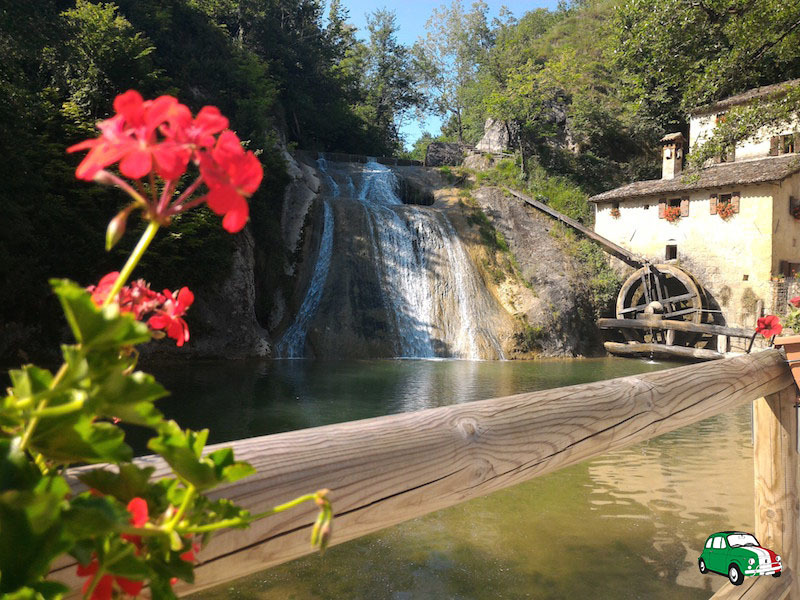 raisin wine) and the enchanting watermill, called Molinetto della Croda. After Refrontolo you will cross Col San Martino, Colbertaldo, Cartizze. As far as the eye can see, you will have in front of you vineyards on steep slopes, which form little cones nicknamed chiocciole (i.e. snails). These hills are scattered with the old Casére, little buildings where farmers still keep hay and instruments. The enchanting panorama in front of the Romanesque Parish Church in San Pietro di Feletto. Just before Valdobbiadene you will drive through the Cartizze area, the land of Prosecco Superiore DOCG. The title of ‘superiore‘ (i.e. upper) means that the producer has followed more restrictive procedural guidelines to obtain it and the wine has aged longer. How much does a bottle of Prosecco cost? I live far away from the land of Prosecco and I use to buy Prosecco at the supermarket. As I told you before, in Italy you can drink Prosecco everywhere and it’s easy to find at any supermarket. The price of a bottle of Prosecco starts from 3.00 €, but how much does good Prosecco cost? You can find a lot of price levels. I don’t know which is the right price per litre, but I can tell you the price of the Prosecco that I bought. I visited Astoria wines in Crevade. This wine house was founded in 1987 by an old family of winemakers. The Astoria’s Prosecco was awarded several prizes and the bottle used for this wine has been created in cooperation with the master-glass workers of Murano, Venice. They are in the Consortium of Tutela del vino Conegliano Valdobbiadene Prosecco and one of the sponsors of Giro d’Italia. How much do you think a bottle of Astoria Prosecco costs? I have paid only 10.00 € for a bottle of Superiore di Cartizze. As my partner is food and wine lover, I have bought one more bottle produced by another wine house called Marotta. I met the wine producer at the Rive Vive event, that takes place every year at the end of May in Farra di Soligo. So I have decided to buy another Prosecco bottle paying 8.00 € for it. Molinetto della Croda is an old watermill in Refrontolo along the Prosecco wine road. 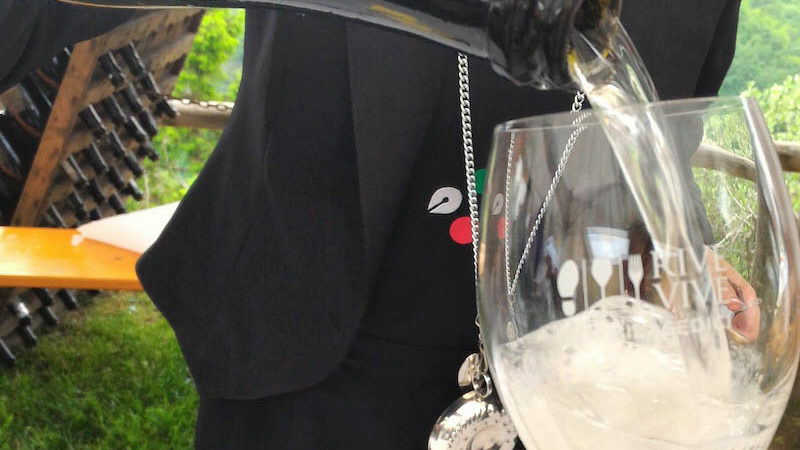 Drink good Prosecco wine and… cin cin! Now you have all the information you need to recognize the best Prosecco wines to buy when in Italy. Prosecco is the perfect wine to drink with your family or your friends and the perfect beginning for a love date. Remember to serve it chilled between 6 and 8 degrees. You can put in the fridge or in the ice bucket with ice and water. You need large tulip glass to better appreciate this Italian sparkling white wine because this kind of glass allows the bouquet to be released. Don’t confuse Prosecco with Champagne, they are completely different! You are welcome! In the next days I’ll write about 2 events: Rive Vive and Primavera del Prosecco. Hope you will read the related articles. I live in the US. Please tell me what brand to buy. At this link you will find the list of wineries that are part of the Consortium of Conegliano Valdobbiadene DOCG. During the tour I tasted Astoria, Mongarda, Marchiori, Bortolin and I really liked them.